There's big trouble in little Brentford. Property developers are planning to destroy the borough's beloved football ground Griffin Park, and build executive homes on the site. Shock! Outrage! Horror! Something must be done to halt this iconoclasm. The lads of The Flying Swan, Brentford's most celebrated drinking house, take up the challenge. Norman the corner shopkeeper has some ideas. He's recently discovered a Victorian computer, which holds the plans to the secret super-technology of a bygone age. And Archroy, Brentford's lone yachtsman and explorer, has just returned from his seventh voyage, bringing with him the fabled Golden Fleece. And then there's Jim Pooley and John Omally, unemployed bachelors of the parish. And then there's that Victorian time traveller who's recently materialised in Norman's kitchen. Surely with all these stalwarts working for the cause, Brentford's football ground is as good as saved. Would it were so, but this is Brentford and ancient forces of evil are forever stirring in the borough. Old Testament terrors, Lovecraftian loathsomes and beasties from the bottomless pit. And if the team make it through to the final, it's going to be a match that no one will forget. What with the fate of mankind hanging upon the result. And everything. Magic, time travel and football, not exactly your everyday combination. 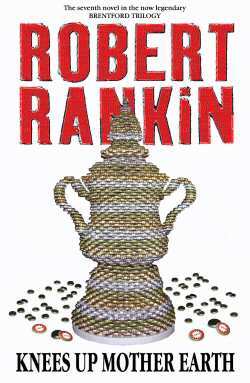 But in this, the seventh book in the Brentford trilogy, which is also the second book in The Witches of Chiswick trilogy, Robert Rankin's best-loved characters return for one last outing and the Father of Far Fetched Fiction spins an epic yarn which will no doubt prove to become a modern classic. Click Here to order the hardback.